Sure the food really should take the spotlight, but dressing up your holiday table with a DIY centerpiece really sets the scene. From Thanksgiving decorations using stocks of wheat to Thanksgiving centerpieces showcasing corn, discover three easy ways to spruce up your Thanksgiving table. More than just a classic symbol of fall, clusters of dried wheat can turn any plain Thanksgiving tablescape into a bountiful festive backdrop for your holiday feast. First, gather your dried wheat stocks into a bunch, keeping in mind that the more wheat you use the bigger punch your Thanksgiving centerpiece will pack. You can often find these stocks of wheat in the dried floral section of your favorite craft store. Next, place your bunch of wheat into your tall hurricane vase and let them go, arranging them in a formation that allows them to lean slightly to the side instead of straight up, forming a circular shape at the bottom. 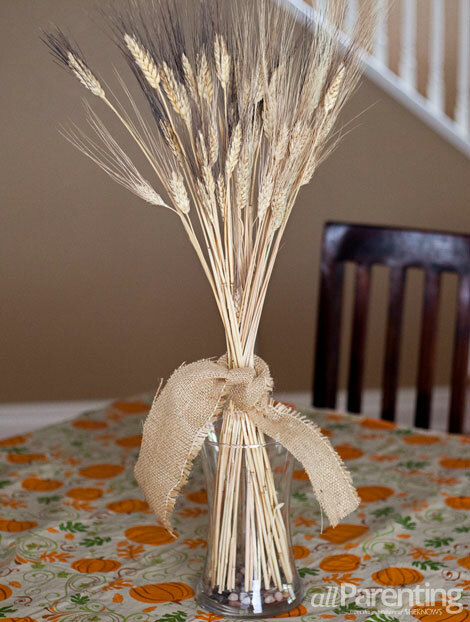 Finally, gently wrap and tie your wheat bunch Thanksgiving decoration with your strip of burlap just above the hurricane vase's rim. Tip: It may be easier to get your wheat bunch to fall into the shape you're trying to achieve by placing a cone-shaped vase or form upside down in the hurricane first. 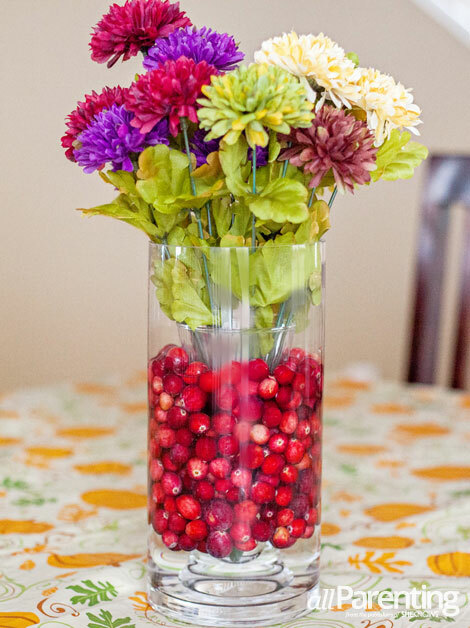 Whether you fancy huge sunflower blossoms or love colorful punches of autumn mums, you can transform your simple flower centerpieces into more elegant Thanksgiving decorations by adding colorful cranberries. First, measure and cut your flowers to fit the height of your hurricane vase. Then, place your skinny highball glass inside the center of your hurricane vase to help guide your cranberries so they aren't floating all around your vase. Next, fill the space between your highball glass and your hurricane vase with cranberries and add water. Be mindful that you do not add more cranberries than the height of your highball glass. Add water to both. Finally, place your fall flowers inside the highball glass and arrange. Now your DIY centerpiece is ready to adorn your Thanksgiving table with ease. 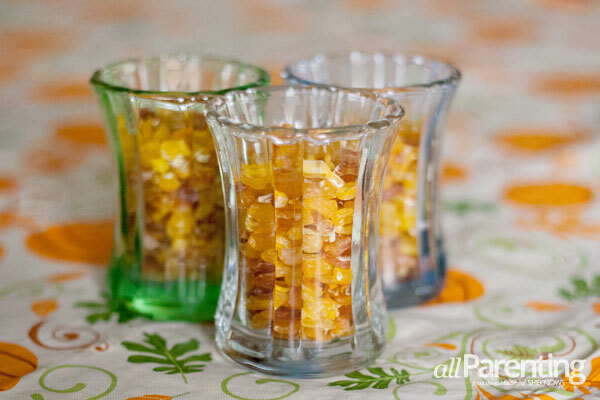 Dried yellow or Indian corn kernels offer the perfect Thanksgiving details when you cluster these DIY centerpieces that also fit any glass containers you have on hand. First, purchase dried corn kernels either online or from a feed store, or substitute with popping corn kernels if you're in a pinch. You can also opt to dry out your own corn kernels by spreading them in a single layer on a baking sheet in the oven at 200 degrees F for 2 to 3 hours, or until they are dried but not burnt. Then, fill your favorite candle holders or other glass containers with your festive and affordable decor and watch your Thanksgiving centerpieces turn into the topic of the night!